Copyright © 2013 Rui Tada et al. This is an open access article distributed under the Creative Commons Attribution License, which permits unrestricted use, distribution, and reproduction in any medium, provided the original work is properly cited. In accordance of the Creative Commons Attribution License all Copyrights © 2013 are reserved for SCIRP and the owner of the intellectual property Rui Tada et al. All Copyright © 2013 are guarded by law and by SCIRP as a guardian. Ligands for macrophage scavenger receptors are reported to induce a wide range of host cell responses, including the production of inflammatory cytokines; however, the underlying mechanisms have not yet been fully understood and which remain obscure. In this study, we have examined the effect of maleylated bovine serum albumin (maleylated-BSA), a well-known ligand of the scavenger receptor, on the murine macrophage cell line RAW264.7. Maleylated-BSA strongly induced the production of tumor necrosis factor-α (TNF-α) and induced phosphorylation of extracellular signal-regulated kinase (ERK) and NF-kB p65. We also observed that maleylated-BSA-induced TNF-α production was blocked by the ERK inhibitor U0126. Together, these data demonstrates that maleylated-BSAinduced production of TNF-α requires the ERK/NF-κB signaling cascade in murine RAW- 264.7 macrophages. Maleylated protein derivatives, such as maleylated bovine serum albumin (maleylated-BSA), possess an abundantly negatively charged functional group and are well-known ligands for the scavenger receptors (SRs) on macrophages [1-6]. In addition to maleylated-BSA, a diverse group of polyanionic agents has been reported as ligands for SRs, including oxidized low-density lipoprotein (oxLDL) , fucoidan , and anionic liposomes [9-12]. SRs compose a large family of structurally diverse transmembrane cell-surface glycoproteins expressed on macrophages, dendritic cells, and endothelial cells. SRs are defined by their ability to bind modified LDL, and according to their multi-domain structure, SRs are classified into 6 different classes (A, B, C, D, E, and F) . Recent studies have shown that macrophage interactions with such SRs ligands as maleylated-BSA, double-stranded DNA, double-stranded RNA, lipoteichoic acid, or fucoidan, elicit distinct patterns of proinflammatory gene expression in murine macrophages . The wide range of recognition of both endogenous and exogenous ligands by SRs could explain the multifaceted receptor functions of macrophages including clearance of pathogen-associated molecular patterns (PAMPs), host defenses against microbial pathogens, production of cytokines, and induction of diseases such as atherosclerosis [14-16]. However, the reason why each SR ligand elicits distinct inflammatory reactions has not yet been clearly identified. For example, fucoidan, a negatively charged polysaccharide, induces nitric oxide (NO) production via p38 mitogen-activated protein kinase (MAPK) and nuclear factor-κB (NF-κB) signaling pathways that are activated through SRs . Maleylated-BSA also induces a complex set of biological effects in macrophages; for example, it (1) up-regulates pro-inflammatory mediators such as tumor necrosis factor (TNF)-α, interleukin (IL)- 1β, and NO, probably via activation of NF-κB [2,4,7] and (2) elicits tumor cell killing . However, the molecular mechanisms underlying these effects of maleylated-BSA on macrophage function are not clear. Therefore, in this study, we examined the effects of maleylated-BSA on the production of cytokines in murine RAW264.7 macrophages. In addition, we investigated the molecular mechanisms including the signaling pathways involved in maleylated-BSA-induced production of cytokines. Murine RAW264.7 macrophages were obtained from the RIKEN BioResource Center (Tokyo, Japan). Maleic anhydride was purchased from Wako Pure Chemical Industries, Ltd (Tokyo, Japan). BSA was purchased from Roche Applied Science (Penzberg, Germany). Lipopolysaccharide (LPS) extracted from Escherichia coli O111: B4 by a phenol-water method was purchased from Sigma-Aldrich (MO, USA). Maleylated-BSA was prepared by the method described Sakai et al. with slight modifications . Briefly, 100 mg of BSA in 10 ml of 0.1 M sodium pyrophosphate buffer (pH 9) was added in drops to 750 µl of 1 M maleic anhydride in dioxane solution on ice. During this procedure, the reaction mixture was continuously adjusted to pH 9 using 1 M NaOH solution. After incubation for 5 min on ice, the reaction mixture was dialyzed extensively at 4˚C against 20 mM sodium phosphate buffer (pH 7.4) containing 150 mM NaCl. 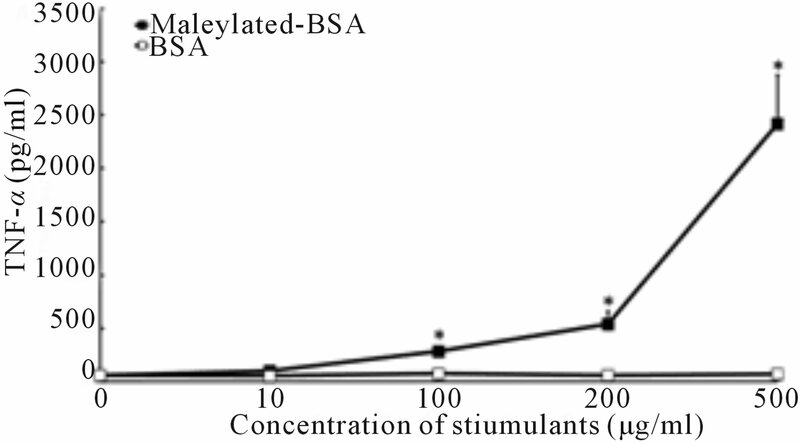 Trinitrobenzene sulfonic acid titration confirmed that almost all lysine groups within the treated BSA were maleylated . SDS-PAGE followed by CBB staining also confirmed absence of any unreacted BSA (data not shown). The protein concentration of maleylated-BSA preparation was determined by using the BCA Protein Assay Kit (Thermo Scientific, IL, USA). The murine RAW264.7 macrophages were maintained in RPMI 1640 medium (Wako Pure Chemical Industries, Ltd, Tokyo, Japan) supplemented with 100 U/ml penicillin G potassium salt (Sigma-Aldrich; MO, USA), 100 µg/ml streptomycin sulfate salt (Sigma-Aldrich; MO, USA), and 10% heat-inactivated fetal bovine serum (FBS; Biowest, USA). Cells were cultured in 48-well flat-bottomed plates at a concentration of 2 × 105 cells/ well in 0.5 ml of culture medium, and stimulated with maleylated-BSA, BSA, or LPS. RAW264.7 cells were cultured at 37˚C for the indicated time in a humidified atmosphere containing 5% CO2 and 95% air. After the times indicated, the culture supernatants were collected and used for the cytokine assay. The cytokine concentrations in the culture supernatants were determined using an ELISA MAX™ Standard Sets (BioLegend, CA, USA) according to the manufacturer’s instructions. The data were expressed as the mean ± standard deviation of the samples assayed in triplicate. At least 3 independent experiments were performed. 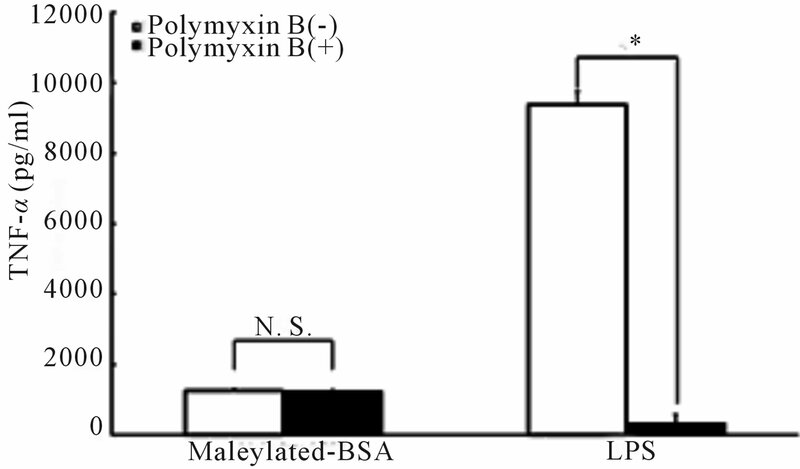 We examined the influence of polymyxin B (PMB) on cytokine production in the maleylated-BSA-stimulated RAW264.7 cells in order to completely rule out the possibility of endotoxin contamination in the prepared samples. In brief, the cells were cultured in 48-well flat-bottomed plates at 2 × 105 cells/well in 0.5 ml of culture medium, and stimulated with a mixture of maleylatedBSA and PMB (10 µg/ml) for 24 h at 37˚C in an atmosphere containing 5% CO2. Semi-quantitative RT-PCR was performed as follows: briefly, total RNA of RAW264.7 cells was extracted by using the ISOGEN kit (NIPPON GENE Co., Ltd., Tokyo, Japan) and quantified by spectrophotometric measurements. cDNA was synthesized from 1 µg of total RNA using SuperScript III RNase H-Reverse Transcriptase according to the manufacturer’s instructions (Invitrogen, CA, USA). The cDNAs were then amplified with primers specific for TNF-α, and β-Actin primers as an internal standard. The primers used for PCR were the following: TNF-α, forward, 5’- TGCCTATGTCTCAGCCTCTTCTC-3’ and reverse, 5’- TCCACTTGGTGGTTTGCTACG-3’; β-actin, forward, 5’-GCACCACACCTTCTACAATGAG-3’ and reverse, 5’-TTGGCATAGAGGTCTTTACGGA-3’. PCR was performed for several cycles with the following cycling parameters: denaturation at 94˚C for 30 s, annealing at 62˚C for 30 s, and extension at 72˚C for 45 s. The PCR products were analyzed on 2% agarose gels after staining and visualization with the SYBR Safe DNA gel stain (Invitrogen, CA, USA). RAW264.7 cells were cultured in 12-well flat-bottomed plates at a concentration of 1 × 106 cells/well in 1 ml of culture medium, and stimulated with maleylatedBSA, BSA, or LPS. RAW264.7 cells were cultured at 37˚C for the times indicated in a humidified atmosphere containing 5% CO2 and 95% air. For protein extraction, the cells were washed twice with PBS and then lysed in lysis buffer (10 mM Tris-HCl buffer (pH 7.2) containing 50 mM NaCl, 1% Triton X-100, 0.1 mM Na3VO4, 1 mM PMSF, 5 mM EDTA, 10 µg/ml aprotinin, and 10 µg/ml leupeptin) and incubated on ice for 1 h. The lysates were then subjected to 10% SDS-PAGE. After blotting of the samples onto PVDF membranes, the membranes were probed with extracellular signal-regulated kinase (ERK)1/ 2 (p44/42 MAPK), phosphor-ERK1/2, p38, phopho-p38, SAPK/c-jun N-terminal kinase (JNK), phospho-SAPK/ JNK, phospho-IκB-α, phospho-NF-κB p65 (Cell Signaling Technology, MA, USA), and glyceraldehyde-3- phosphate dehydrogenase (GAPDH; Santa Cruz Biotechnology, Inc., CA, USA), according to the manufacturer’s instructions. Probe binding of blotted proteins on the membranes was visualized using ImmunoStar LD (Wako Pure Chemical Industries, Ltd, Tokyo, Japan) on a LAS-3000 (Fuji-film, Tokyo, Japan). To determine the role of MAP kinase pathways in maleylated-BSA-induced production of TNF-α, we investigated the effects of various MAP kinase (MAPK) inhibitors on TNF-α production in RAW264.7 cells as follows: the cells were cultured in 48-well flat-bottomed plates at 2 × 105 cells/well in 0.5 ml of culture medium, and treated with various MAPK inhibitors for 1 h. After the treatment, the cells were then stimulated with maleylated-BSA for 24 h at 37˚C under 5% CO2. Statistical significance of differences between means was assessed by using Student’s t test. Figure 1. Effects of maleylated-BSA on TNF-α production in murine RAW264.7 macrophages. 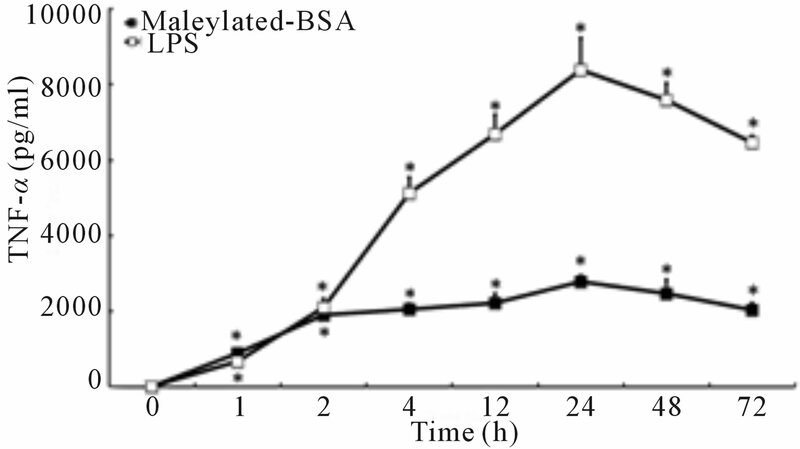 (a) RAW264.7 cells were stimulated with 5 concentrations of maleylated-BSA (0, 10, 100, 200, and 500 µg/ml) for 24 h. (b) Kinetics of TNF-α production in the culture supernatant of RAW264.7 cells stimulated with maleylated-BSA (200 µg/ml) cultured for 0 to 72 h. The culture supernatants were collected at the time indicated, and the TNF-α concentrations therein were determined using an enzyme-linked immunosorbent assay (ELISA) system. The data obtained were representative of at least 3 independent experiments and are expressed as the means ± standard deviation for samples assayed in triplicate. Values statistically significantly different from those in the control are indicated by *(p < 0.01). (c) mRNA expression of RAW264.7 cells after 1 h stimulation with (lane 1) control, (lane 2) maleylated-BSA (200 µg/ml), (lane 3) BSA (200 µg/ml), or (lane 4) LPS (10 ng/ml). Total RNA was isolated and RT-PCR-amplified TNF-α cDNA and that of the control (b-tubulin) were loaded onto an agarose gel and DNA bands visualized by staining with the SYBR safe gel stain. BSA did not induce the production of other cytokines, including IL-12p70, granulocyte macrophage colonystimulating factor (GM-CSF), IL-6, IL-10, and transforming growth factor (TGF)-β1 (data not shown). Next, to rule out the presence of contaminating endotoxin in the maleylated-BSA samples, we examined whether PMB, a well-known endotoxin inhibitor, affected TNF-α production in our macrophages [18,19]. We observed that the PMB treatment did not affect maleylated-BSA-induced production of TNF-α, whereas LPS treatment completely abrogated TNF-α production (Figure 2). Thus, these results ruled out contamination of endotoxin in our experiments. Moreover, these data indicated that the maleyl-group attached to BSA was responsible for inducing the production of TNF-α from murine RAW264.7 macrophages. Figure 2. Effect of PMB on maleylated-BSA-induced TNF- α production. RAW264.7 cells were cultured for 24 h along with a mixture of PMB (10 µg/ml) and maleylated-BSA (200 µg/ml) or LPS (10 ng/ml). The culture supernatants were collected, and the TNF-α concentrations therein were determined using an ELISA detection system. The data obtained were representative of at least 3 independent experiments and are expressed as the means ± standard deviation for samples assayed in triplicate. Statistically significant differences from the PMB untreated group are indicated by asterisks (*p < 0.01). N. S., not significant. various inflammatory stimuli through the signaling cascade mediated by mitogen-activated protein kinases (MAPKs) and NF-κB pathways [20-22]. Therefore, we investigated the involvement of ERK1/2, p38 MAPK, and JNK in maleylated-BSA-induced TNF-α production in RAW264.7 cells. First, to determine the role of ERK1/2, p38 MAPK, and JNK in maleylated-BSA-induced TNF-α production, we used western blotting to analyze the phosphorylation profiles of these proteins after stimulation with maleylated-BSA. Our results showed that maleylated-BSA induced phosphorylation of ERK1/2 within 5 min, but did not induce phosphorylation of p38 or JNK. As expected, phosphorylation of ERK1/2 was not observed after stimulation with BSA (Figure 3). Next, we examined the phosphorylation of the NF-κB p65 protein after stimulation with maleylated-BSA. As shown in Figure 3, maleylated-BSA induced phosphorylation of NF-κB p65, indicating that maleylated-BSA activates the NF-κB signaling pathway. Taken together, these data suggested that maleylated-BSA elicits the production of TNF-α in murine RAW264.7 macrophages via ERK/NF-κB signaling pathways. To further characterize the role of the ERK1/2 signaling pathway in maleylated-BSA-induced TNF-α upregulation, we investigated the effect of various chemical inhibitors of the MAPK pathways. As shown in Figure 4, U0126, a MEK/ERK inhibitor, blocked maleylatedBSA-induced TNF-α production in the RAW264.7 cells. Figure 3. 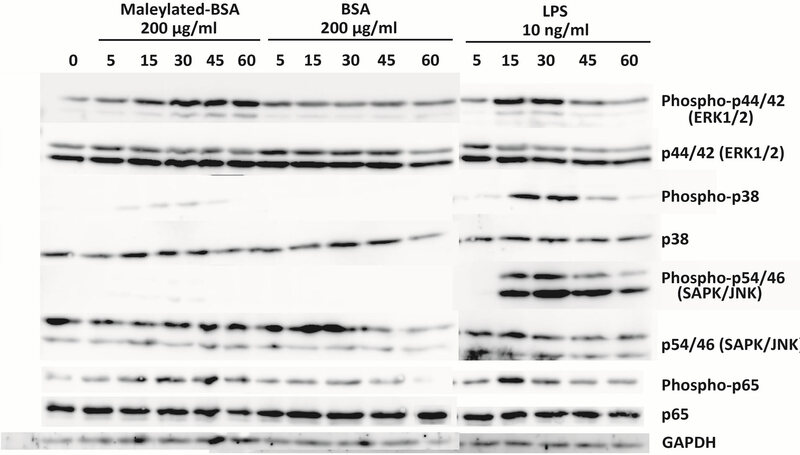 Western blot analyses of the phosphorylated proteins in MAPK and NF-κB signaling pathways after maleylated-BSA stimulation. RAW264.7 cells were stimulated with saline, maleylated-BSA (200 µg/ml), or LPS (10 ng/ml) for the times indicated. Whole-cell lysate were loaded and separated on 10% SDS-PAGE gels and phosphorylation of the signaling proteins was detected by using the specific antibodies shown in the figure. Data are representative of 3 separate experiments. Figure 4. Effects of various MAP kinase inhibitors on maleylated-BSA-stimulated production of TNF-α. RAW264.7 cells were treated with various inhibitors (U0126, SB 239063, or SP 600125) for 1 h and then incubated for 24 h in the presence of maleylated-BSA (500 µg/ml). The culture supernatants were collected, and the TNF-α concentrations therein were determined using ELISA. The data obtained were representative of at least 3 independent experiments and are expressed as the means ± standard deviation for samples assayed in triplicate. Statistically significant differences from the means of the inhibitor-untreated group are indicated by asterisk (*p < 0.01). In contrast, and as expected, SB203580 and SP600125, inhibitors of p38 MAPK and JNK, respectively, did not block the production of TNF-α in the RAW264.7 cells, indicating that maleylated-BSA induced TNF-α production via an ERK-dependent pathway. In this study, we report that the ERK/NF-κB signaling pathway is required for maleylated-BSA induced production of the pro-inflammatory cytokine TNF-α in murine RAW264.7 macrophages. Recent studies have shown that maleylated-BSA serves as the ligand for scavenger receptors; however, the biological impacts of the ligand on scavenger receptors on immune cells, such as macrophages, have remained obscure: 1) Alford et al. reported that maleylated-BSA induces NO production via interactions with the low-affinity scavenger receptor from murine macrophages . 2) Only one ligand, a negatively charged polysaccharide, for the scavenger receptor fucoidan induces the activation of inducible nitric oxide synthase and subsequent NO production in RAW264.7 macrophages through p38 MAP kinase/NF-κB-dependent pathways [7,8]. 3) In contrast, Otsuka and colleagues have reported that maleylated-BSA inhibits NO production in LPS-stimulated RAW264.7 macrophages, suggesting that ligands for scavenger receptors, such as maleylated-BSA, inhibit pro-inflammatory pathways in macrophages [9-11]. Here, we have shown that maleylated-BSA directly induces the production of the proinflammatory cytokine TNF-α via ERK/NF-κB signaling pathways. Although we do not yet know which of the receptor(s), such as macrophage scavenger receptors, are responsible for the maleylated-BSA-induced production of TNF-α, the findings of this study have provided new insights into the biological activities of these negatively charged molecules. Further, these insights might promote the use of maleylated derivatives as biomaterials and as tools for investigating the function of SRs. Bansal, P., Mukherjee, P., Basu, S.K., George, A., Bal, V. and Rath, S. (1999) MHC class I-restricted presentation of maleylated protein binding to scavenger receptors. Journal of Immunology, 162, 4430-4437. Misra, U.K., Shackelford, R.E., Florine-Casteel, K., Thai, S.F., Alford, P.B., Pizzo, S.V. and Adams, D.O. (1996) Maleylated-BSA induces hydrolysis of PIP2, fluxes of Ca2+, NF-kappaB binding, and transcription of the TNFalpha gene in murine macrophages. Journal of Leukocyte Biology, 60, 784-792. Rao, K.M. (2001) MAP kinase activation in macrophages. Journal of Leukocyte Biology, 69, 3-10. Means, T.K., Pavlovich, R.P., Roca, D., Vermeulen, M. W. and Fenton, M.J. (2000) Activation of TNF-alpha transcription utilizes distinct MAP kinase pathways in different macrophage populations. Journal of Leukocyte Biology, 67, 885-893.